The waste disposal company takes care of environmentally friendly disposal of residual waste and cleaning of wastewater on behalf of the city council. The sewage treatment plant is one of the most modern in Europe and designed for a population equivalent of 1.2 million. Approx. 350,000 t of waste from 1.3 million people are disposed of annually in the waste and sewage incineration plant. The energy released through waste incineration not only covers the requirements of the plant, but also supplies around 12,000 households with electricity and 8,000 households with district heating. Untreated well water was previously fed in, with quality values suddenly deteriorating and leading to a loss in quality in tap water. This resulted in frequent shutdowns of the EDI. The waste disposal company ordered a Mobile Water Services plant at short notice with a throughput of 30m3/h to ensure the uninterrupted operation of the water treatment system and, consequently, the incineration plant. The system was intended to compensate for water quality fluctuations until the new well water treatment plant was completed and to assure a conductivity of <0.1 µS/cm and silicate content of <10 ppb for the boiler feed. 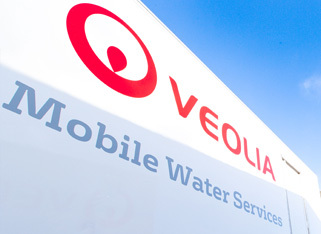 The waste disposal company operates a Veolia Berkefeld plant employing reverse osmosis and electrodeionisation (EDI) to treat boiler feed water. The advantages A type MODI 5x300C demineralisation plant was delivered only six hours after the request being made. After a further two hours, a Mobile Water Services technician had integrated the plant in the existing water treatment system and commissioned it. The container with ten ion exchangers was installed between the reverse osmosis and EDI plant. The plant was operated fully automatically here, running around the clock in the initial phase. Later on, the system was activated via a bypass whenever the quality of the well water deteriorated. The extremely short reaction time enabled the maintenance of smooth operation at the waste and sewage sludge incineration plant – despite the unexpected deterioration in feed water quality.